Does this modern take on a celebrated console stay true to the original’s heritage? Back in the late 1960s, London’s Trident Studio quickly built a reputation as one of the first studios to go to if you wanted to record a hit — clients included Genesis, Supertramp, Lou Reed, David Bowie, Elton John, Marc Bolan and Queen, and even the Beatles ventured there when they needed an eight-track tape machine to record ‘Hey Jude’ (Abbey Road still used four-track devices at that time). 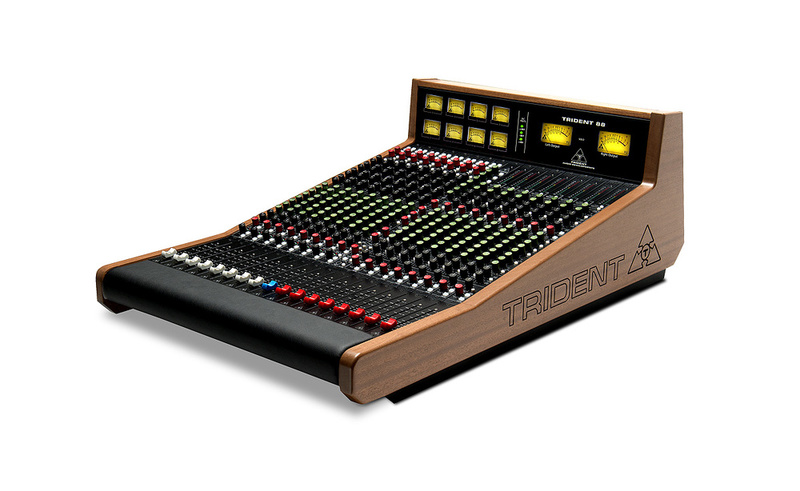 Trident’s success wasn’t all down to gear, of course, but the mixing console did make a significant contribution. Back then, multitrack recording consoles weren’t items that you could buy or even order from your local dealer. In the case of Trident, the engineers and studio owners sat down and discussed their needs, and then engaged some design engineers to create something that would meet them. The sound of the preamps, when pushed hard, and of the EQ section in that first console, combined to create a uniquely appealing ‘voice’. Trident went on to build and sell various versions of this mixer commercially, many of which found their way into studios in the USA. 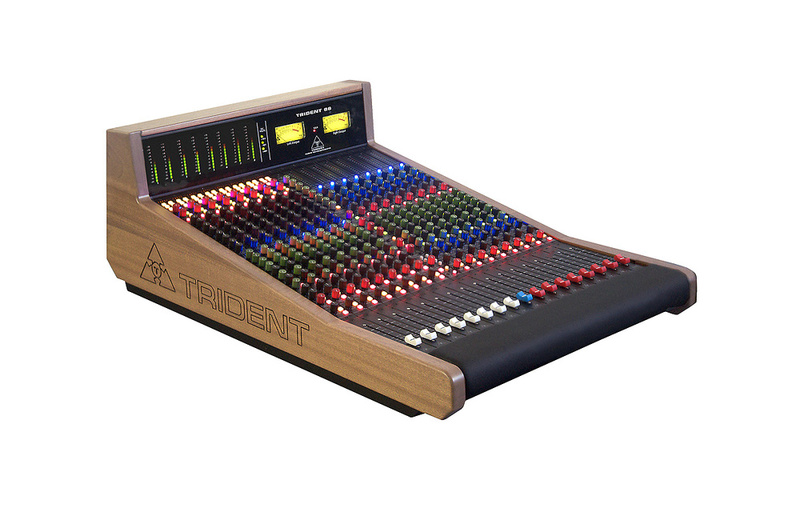 The Trident brand and associated intellectual property has long since passed into the ownership of PMI in the US, and that’s where the latest incarnation of the console, the Trident 88, is built. The design work, though, was done here in the UK by Taz Boghal, one of the lead electronic engineers at Trident when the Series 80B started life. Taz stayed with the company until 1988, but is now employed by PMI as the lead electronic engineer for their Trident range. He’s endeavoured to improve both the specifications and feature set, while keeping the new console faithful to its Trident heritage. Standard production models come in eight-, 16-, 24-, 32-, 40- and 48-channel sizes, but larger versions are also available on request, and are built to order. We were invited to review the smallest model, which has eight input channels and eight bus/monitor channels but is still quite heavy and boasts exactly the same feature set as its larger siblings. At a hint over three feet from front to back, and with the top of the meter bridge standing around 13 inches from the base, this is a solidly built console. It has a substantial rackmountable external power supply, which helps to keep magnetic fields well away from the audio circuitry. A fan is used to cool the PSU, and although it isn’t particularly noisy, I’d still have liked it to be a little quieter. 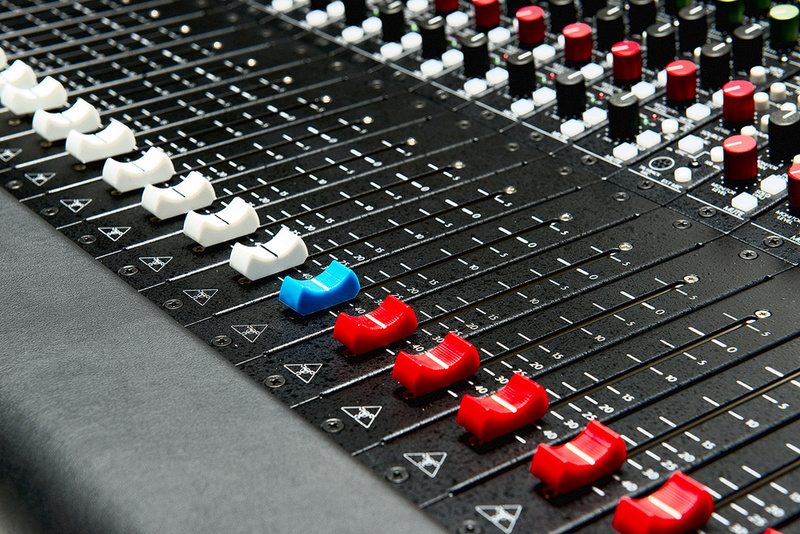 One of the main benefits of the Trident 88 series is that, as well as the in-line channel strips providing two inputs each at mixdown, there’s a split-console-style monitor/group section, allowing the monitor channels to be used as bus masters, conventional monitor inputs or additional line inputs when mixing. In practical terms that means that, at mixdown, even this smallest model offers a very generous number of inputs, each with separate EQ. The control layout is deliberately conventional, so it should feel familiar to any engineer brought up on an analogue console, but there’s enough flexibility for integration into a number of modern DAW-based studio configurations. In this particular configuration, then, it’s an obvious competitor for high-quality compact consoles such as API’s The Box (http://sosm.ag/api-thebox). Cost options include Lundahl 1538 transformers (for any or all of the input channels) and Lundahl 1517 output transformers, and these can all be retro-fitted to consoles that are bought without them. Our review model didn’t have any transformers fitted, and the TriMix fader automation package option wasn’t available while testing (we’re told that this will be available soon). There’s also a choice of a moving-coil or LED bar-graph meter bridge, though you’ll have to decide at the time of purchase which you prefer, as these can’t be swapped at a later date. The review sample was fitted with back-lit VU meters. The vast majority of the switches are illuminated and the familiar straight-sided Trident aluminium knobs are used for all rotary controls, with red, black and green anodising used to separate the functions visually. The master fader has a blue cap, the input channels have white caps and the group faders have red caps — all of this is a simple yet very effective means of helping you find your way around the console quickly and easily. In this cropped rear-panel shot, you can see the connections for two input channels on the far right. Unusually, these include a dedicated input for external mic preamps, bypassing the onboard ones, which could come in handy in a modern studio.All the relevant rotary controls, such as cut/boost knobs, incorporate centre detents and all the knobs have a smooth, positive action. The same can be said of the faders and switches, which all felt top-class to me. I did, however, feel that the master monitor level control could have been made either a different colour or a different size, as it isn’t always easy to locate it, especially as the console legending uses a fairly small and light font that can be difficult to read in a dimly lit studio. This is a very minor issue, though, and one that sticks out more in testing than when you own a product such as this — I’m sure you’d very quickly come to remember where it is! The construction is largely old-school, insomuch as there are solid wooden end-cheeks and a ‘sit-up’ meter bridge. The desk is fully modular, so individual strips may be removed separately for servicing or exchanging. Discrete components, including a transistor front end, are used for the Class-A mic preamps. The chip stage is socket-mounted, though most of the components that come after the preamp stage, other than the electrolytic capacitors and some active devices, are surface-mounted on through-hole-plated, double-sided PCBs. That means that servicing is most likely intended by changing strips rather than diving in with a soldering iron. Realistically though, unless you’re unfortunate enough to have a master module or PSU die on you, you should be able to carry on working after removing the offending module. All the modules plug into a back plane and are easily removed after unscrewing two retaining screws. A jumper on the input channel board allows the direct channel output to be sourced pre- or post-EQ. All the main connections are on the rear, with the mic inputs presented via XLR/jack combi connectors. The jack section is essentially a 20dB padded input with no phantom power. Other than the main, monitor and talkback mic connectors (all XLRs), the connectors are quarter-inch jacks. While D-subs and the like might be neater, they’re harder to wire up and generally rather more expensive to buy ready made, so this is no bad thing. Vertical rows of sockets cater for Line Input, Monitor Return Input, Channel Insert (unbalanced TRS send/return jack), Direct Out, Mic Insert and Mic inputs. 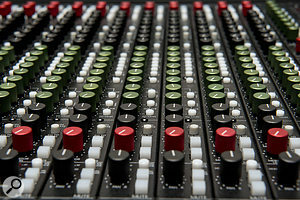 For the Main/Group section there are rows of connectors for the Stereo FX Returns (unbalanced), Monitor Returns, Group Inserts (unbalanced), Group Outputs and Aux Outputs, with further master-section connections for the Main Output (XLR), Main Inserts (unbalanced), 2-Track Return, Studio Playback, Alternate Speakers 1/2 and a stereo Monitor Out. There an inbuilt talkback mic, but there’s also an XLR socket to accommodate an external talkback mic. All sizes of Trident 88 are available with an LED meterbridge pictured here, or the more expensive VU meterbridge shown in the first picture.In this configuration, the input channels are arranged to the left of the master section, with the Group channel strips located to the right. The moving-coil metering for the channels is arranged in two rows, while the main output is watched over by two larger moving-coil meters. Green and red LEDs at the bottom of each channel strip act as signal-present indicators and peak warning indicators. The input module follows the familiar in-line format, with both the input and the monitor (tape returns) on the same channel. The TRS insert point is switchable to pre- or post-EQ but there’s also a dedicated and switchable ‘Mic Preamp Insert’. Despite the name, this is really an alternative input rather than an insert: it’s an unusual but very useful feature in the modern studio, as it allows you to bypass the internal mic preamp while patching in an external one. The audio bandwidth of the circuitry is impressive, reaching around two octaves above the range of human hearing, with barely a third of a decibel deviation from flat. At the head of each input channel is a small routing section for the main channel path, with buttons for the four group pairs and one for the main mix bus. Channel pan pots are used to steer signals between odd and even buses in the usual way. As with many consoles that use conventional routing buttons, channels can be sent to both the stereo bus and any bus group pairs at the same time, which makes it really easy to set up parallel compression. Below this section is a pair of gain controls, one each for the mic and line inputs. Push switches select the mic insert, +48V phantom power, mic/line input, polarity invert, channel monitor and ‘Input Reverse’. Input Reverse selects between the line and monitor inputs: the selected source goes by default to the monitor section of the input channel. The channel monitor path routes directly to the stereo bus and is controlled by a rotary level control rather than a fader. However, switching on both Line and Input Reverse sends the monitor mix through the main channel path, so that the mix can be handled using faders and the full complement of sends and EQ. The Channel Monitor control determines whether the meter shows the Direct Output level or the Monitor Return level. The transformerless preamps that featured on our review model sound nice and clean, but without being in any way ‘clinical’. With sources such as drums or bass guitar, you can push them some way into the red to thicken up the sound in a musically useful way, too. A generous degree of overload abuse may be useful to liven up a solo snare drum, but on most sources, you’ll need to judge the amount of overload very carefully and that can only be done by ear — if you overdo it, that gentle warmth eventually gives way to much more obvious distortion. Arranged as four sweepable bands and following the same general topography as Trident’s original channel EQ, the EQ section has upper and lower shelving sections plus two mid-range ‘bell curve’ filters. The upper-mid control covers a frequency range of 700Hz to 10kHz, with a filter bandwidth of roughly one octave, and the lower-mid covers 100Hz to 1.5kHz, and both mids have a gain range of ±15dB. The two shelving filters have the same gain range, and the HF one can be set between 1 and 15 kHz, and the LF between 40 and 650 Hz. All in all, then, there’s a useful degree of overlap between the different bands. Further buttons engage a third-order, 50Hz high-pass filter and place the insert pre or post the EQ section. A variable frequency high-pass filter might have been useful, as higher frequencies are sometimes needed to avoid mic popping, but there’s a limit to what you can put in a channel strip. There’s also an insert On button and an overall EQ bypass. Given that the insert can be bypassed from the channel strip, I felt that on a console of this calibre, balanced insert sends and returns would have been preferable, on the basis that most (though by no means all) outboard gear is designed for balanced operation, so as to avoid the risk of ground loops. I gather that PMI have had similar feedback from some of their prospective customers, and they tell me that they may yet add balanced inserts in the future. In most cases, though, unbalanced connections at the insert point will work just fine, which goes some way to explaining the original design decision. Coloured fader caps for different channel types, and the different coloured knobs for different sections of each channel, help to make navigation around the console a little more intuitive.Trident’s EQ is reputed to help create a big-sounding low end without making the lows sound indistinct or ‘wallowy’, and that’s certainly the case here. Bass synths, bass guitar and kick drums can be made to sound gratifyingly weighty without losing focus or tightness. The mids cover a generous range and the bandwidth seems to be a practical compromise, given that the EQ is not fully parametric. The ability to tune the high shelving control makes it very useful for adding ‘bite’ or ‘air’, while keeping those boosts well out of the way of the harsher ‘presence’ region. Overall, I’d probably describe the EQ as ‘workmanlike’, but I really don’t mean that in a disparaging way! Rather, I mean that it just gets on with the job in hand, doing exactly what you want of a channel EQ, with the minimum of fuss. In common with most high-quality EQ designs, you can apply it quite generously without incurring phasey artifacts, and everything retains a strong and pleasing sense of focus. The console’s eight auxiliary sends are arranged as four mono plus two stereo sends, and each can be switched individually to pre or post fader. To maintain flexibility, Aux 1, Aux 2 and Aux 7/8 can be switched independently into either the main channel or monitor path as required. While the main channel EQ is a four-band, sweepable design, the monitor section has a simple Tilt EQ, with a pivot point around 650Hz. This EQ is flat in its centre position, so has no bypass option, but I found it extremely useful for simply brightening or darkening a sound and, being uncomplicated, it doesn’t seem to mess with the integrity of the sound. If that’s not enough for you, the two EQ sections can also be flipped to exchange positions as required. This ability to flip both the EQ and four of the sends means that a monitor mix can be run with effects and full EQ without needing to take over the main channel path. When mixing down a completed recording, the usual way of in-line working is to use the main channel signal path fed from the channel Monitor Inputs for the recorded tracks, leaving the main inputs free to accommodate additional live sources, such as MIDI instruments being run in sync with the track. One of the beauties of this in-line-plus-group/monitor-channel topography is that you get plenty of usable inputs when you come to mixdown, as the group/monitor channels can be configured as additional inputs. Below the Monitor Tilt EQ control are the pan and level controls for the monitor path. For soloing, the input channel has both PFL and AFL while the monitor path has AFL solo only. These affect only the monitor output and not the main outputs. Further buttons provide EQ to Monitor flipping and Mon Mute and, finally, there’s the main channel pan pot with Solo and Mute buttons alongside. Mute silences the channel signal and all its aux sends. Solo has a further button to select between AFL and PFL modes. The master section occupies just one single-width module strip, and encompasses monitoring for up to three sets of speakers, each with separate level controls. Also in this section are controls for talkback, headphone outs with a front-panel mini-jack (headphones follow the Control Room selections), Aux masters with solos, 2-Track playback with mini-jack input, and test oscillator frequencies at 1 and 10 kHz. A master Solo level control is fitted, along with a master Solo LED that informs you when this facility is engaged. 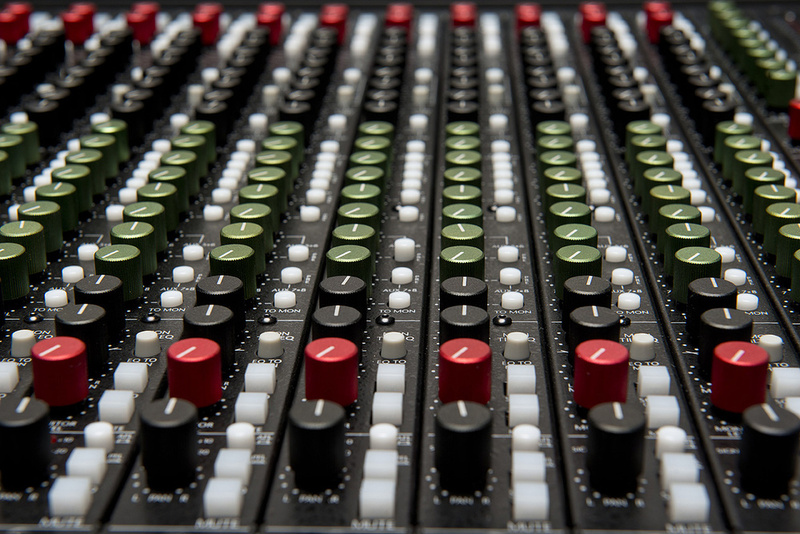 The talkback mic or test oscillators may be routed to the Aux pairs, the Groups or the Studio feed, which has its own level control and on/off switch, and is fed from either the left/right mix, a mono Aux 1 and 2 mix, or the stereo mix of Aux 7/8. Monitor Mono and Mute buttons are provided and, as expected, these affect only the control-room Monitor Output, not the Main mix output. There’s no monitor Dim button here. It’s not exactly an essential, and PMI tell me they’re planning to add a dim facility in the future, but it’s worth being aware of if you’re one of those engineers who likes to set up a calibrated listening level — a Dim button helps make sure you return to it after answering the phone! In all other respects, the master section provides all the essentials and, thankfully, isn’t cluttered with unnecessary or confusing functions. Each of the eight Group Monitor sections kicks off with a 12-segment, peak reading meter. The metering and signal source can be switched between the Group or Monitor Return jacks, providing the option for more line inputs at mixdown, as I alluded to earlier. An Aux To Mtr switch overrides the above meter routing and sets the meter to monitor the associated Aux Output post the Aux Master Level control on the master module, so it provides an easy way to confirm whether the aux outputs are carrying appropriate levels of signal. The master effects controls are also located in this strip. A control sets the balance of the stereo Effects Return signal fed to the Aux 7 and Aux 8 buses, providing a straightforward way to add effects to your monitor mixes. These are followed by an FX To Aux level control and pre/post switching, so the source can be selected pre or post this level control. The effects returns also benefit from a switchable Baxandall-style two-band EQ at 12kHz and 80Hz, and this has a bypass button. This type of EQ has a very natural sound and is often all you need for bus EQ, or for fine-tuning an external input. The stereo effects return section has both balance and level controls. The Groups also include sends to the eight aux buses: sends one to four have individual pre/post switching, while the remaining two stereo sends are pre/post-switchable with pan controls. Baxandall-style two-band shelving equalisers (12kHz and 80Hz) are again made available for the Group signal, and there are Monitor Pan and Monitor Level controls below. AFL solo and Mute buttons are available on all Groups. A Fader Reverse button swaps the Monitor level control with the Group fader control, though the solo and mute functions stay as they were. In common with most well-designed analogue mixers, the experience of mixing on the Trident 88 is very different from mixing in the box, but it’s not only because of the physicality of the controls. There’s seemingly something more ‘solid’ and well-integrated about the sound too. Instruments and voices seem easier to balance than when mixing ‘in the box’, as they seem somehow to have less of a tendency to get lost in the mix. Having an effective ‘hands on’ analogue equaliser in each channel also makes a big difference. I really like the EQ because it doesn’t have so much character that it becomes a one-trick pony, yet it still adds a sense of finesse and focus to the sound, even with relatively small adjustments. The preamps are also quiet and suitably transparent, with headroom enough to permit creative overdriving before anything too nasty sets in. I would have liked to have heard the transformer-coupled versions — given the relatively small cost involved it would probably be worth getting at least a couple of input channels fitted out with them, just to offer you a choice of preamp characters. It’s also worth reiterating that even this smallest model has a large number of inputs available when you come to mix, and all have access to some type of EQ. Even the channel design offers a larger than usual choice of inputs if you take the Mic Insert into account. 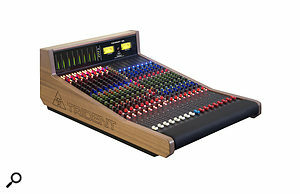 For the serious studio owner wanting to marry the traditional analogue console tracking and mixing paradigm to a software DAW-based recording system, the Trident 88 has much to commend it, though of course it is equally well-suited to those still choosing analogue tape or digital multitrack devices as their recording format. 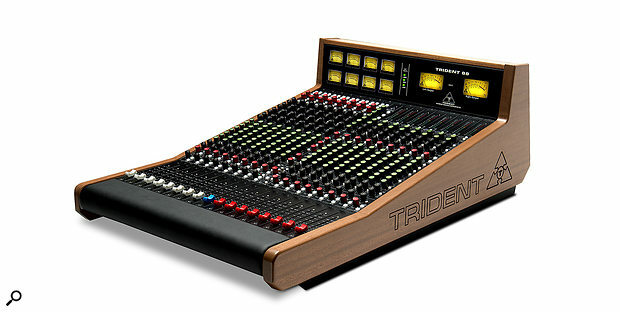 Clearly, the Trident 88 is far from being a budget mixer, but a two-year warranty comes as standard (this is upgraded to three years once the console is registered) and it still manages to be more affordable than much of its real competition — its new price is about that of some second-hand competitors — while also outgunning most of them on features. Of course, much of this console’s appeal is also due to the Trident sound and heritage — and that’s something that this range of mixers upholds with style. API’s The Box is an obvious competitor to this smallest Trident 88. Audient, Harrison and Rupert Neve Designs, among others, also build highly respected small consoles. SSL’s XL Console includes 500-series integration, as does Ocean Audio’s Ark. The lower-cost Toft ATB series is not engineered in the same modular way, but its circuitry is ‘Trident inspired’. Allen & Heath offer the more affordable ZED-R16 and larger GSR24, which is also available with fader automation. Base prices are as set out in this table. Models with higher input-channel counts are available to special order. LL1538 Lundahl input transformers may be included at a cost of $150 per input channel, and LL1517 Lundahl group/output transformers for $200 per channel, and spare channels may also be purchased. Automated faders will be sold in banks of eight but pricing was not available when going to press. Base prices are as set out in this table. Models with higher input-channel counts are available to special order. LL1538 Lundahl input transformers may be included at a cost of £99 per input channel, and LL1517 Lundahl group/output transformers for £99 per channel, and spare channels may also be purchased. Automated faders will be sold in banks of eight but pricing was not available when going to press. Prices include a large wooden shipping crate, but exclude shipping and VAT. Fully modular, robust construction for ease of servicing. Both in-line and group/bus channels allow for a large number of inputs, each with EQ, at mixdown. Solid audio performance based on the Trident heritage. The only niggles are relatively minor, such as the lack of a Dim button and the use of TRS unbalanced insert points. PMI Audio have succeeded in updating the original Trident concept to meet the needs of the modern studio. PMI Audio +1 310 323 9050.